Hohenwittlingen was a castle in the Urach district of Württemberg, 2,259 ft. above sea level, on a cliff that projects like a promontory into the Ermstal, 25 minutes from the village of Wittlingen. 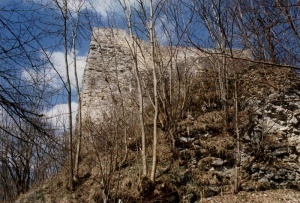 The castle was built about 1100. When Johannes Brenz was compelled to flee from the emperor's wrath in 1548, Duke Ulrich concealed him in Hohenwittlingen. There under the pseudonym of Johannes Wittlingius he wrote his exposition of Psalms 94 and 130, and the treatise, An magistratus iure possit occidere Anabaptistas aut alios haereticos (Whether a magistrate has the legal right to execute Anabaptists or other heretics) (Koehler, Nos. 163 and 261, p. 69 and p. 117). Hohenwittlingen before this, wrote a Rechenschaft of their faith in 1562 (TA Württemberg 1049) and also two songs, "Gott haltet steif was er verheisst," and "Herr Jesu Christ in deinem Reich" (Lieder der Hutterischen Brüder, 714 and 718). On 11 February 1564 Hornikel was taken to Stuttgart for a new cross-examination and was then expelled from the country; he went to Moravia. In 1574 Matthias Binder of Frickenhausen, a tailor and preacher, was taken to Hohenwittlingen. He had previously been held a long time in the dungeon at Maulbronn, where Blasius Greiner had also been. In 1573 and several following years the prison also held Leonhard Sommer of Necklinsberg, Jakob Gantz of Ossweil, and Martin Klopfer. When in the late fall of 1576 a fire broke out in the castle, Glock and Binder took an active part in extinguishing the flames, and were released by order of the duke, to go to Moravia. The castle was repaired and the prison continued to be used. The following were imprisoned there: Simon Kress of Gündelbach 1582-1596; Michael Hasel of Gudersberg, 1588-1592; and in 1590 Franz Feyerabend of Oppelsbom. From 1574 to 1594 the pastor of the adjacent village of Hengen was Stephan Geer, the father of the Anabaptist leader Georg Geer. It is possible that youthful impressions of Hohenwittlingen contributed to his decision to join the Anabaptists. Hans Dauber of Illingen, who had been imprisoned six years on Hohenurach and released in 1588, and who had merely attended the preaching in Illingen, not the communion, was in Hohenwittlingen in 1596. In that year he and Kress were permitted to attend church services. They sang with the audience, indicated their approval by nodding their heads, and their disapproval by averting their faces. This conduct caused the congregation to doubt the Scripturalness of the pastor's teaching; their attendance at church was discontinued. The castle superintendent, Claudius Robert, thought they should turn the wasteland before the castle into meadowland, for they would be more easily won by the pick and hoe than by the Bible. Hoes and spades were also recommended in 1612 by the church authorities for the treatment of Dauber, who is mentioned as late as 1617 as an obstinate Anabaptist (TA Württemberg). The castle governors Hans and Jakob von Talheim, and Robert and Glas Miller treated the Anabaptists kindly. Glock had absolute freedom of movement and was used as a messenger. Likewise Kress moved freely in 1582 and worked in front of the castle. Under Duke Christoph in 1559 they had been permitted to move several hours, fastened only to foot-irons. Clock was satisfied with the food; the court chaplain Lukas Osiander in 1584 thought it was as good as that of a benefice. Exceedingly laudatory is the testimony the castle governor gave the deceased Michael Hasel. In 1608 the castle governor Miller was even under suspicion of Anabaptist leanings because of quiet conduct (TA Württemberg 308). After the beginning of the Thirty Years' War there were no more Anabaptists in Hohenwittlingen. Bossert, Gustav. Lieder der Hutterischen Brüder. Scottdale, 1914. Hege, Christian and Christian Neff. Mennonitisches Lexikon, 4 vols. Frankfurt & Weierhof: Hege; Karlsruhe: Schneider, 1913-1967: v. II, 337 f.
Köhler, Walther. Bibliographia Brentiana: Bibliographisches Verzeichnis der gedruckten und ungedruckten Schriften und Briefe des Reformators Johannes Brenz ; nebst einem Verzeichnis der Literatur über Brenz, kurzen Erläuterungen und ungedruckten Akten. Berlin: C.A. Schwetschke und Sohn, 1904. Bossert, Gustav, Sr. "Hohenwittlingen (Baden-Württemberg, Germany)." Global Anabaptist Mennonite Encyclopedia Online. 1956. Web. 24 Apr 2019. http://gameo.org/index.php?title=Hohenwittlingen_(Baden-W%C3%BCrttemberg,_Germany)&oldid=120141. Bossert, Gustav, Sr. (1956). Hohenwittlingen (Baden-Württemberg, Germany). Global Anabaptist Mennonite Encyclopedia Online. Retrieved 24 April 2019, from http://gameo.org/index.php?title=Hohenwittlingen_(Baden-W%C3%BCrttemberg,_Germany)&oldid=120141. Adapted by permission of Herald Press, Harrisonburg, Virginia, from Mennonite Encyclopedia, Vol. 2, pp. 787-788. All rights reserved.